Today, in part thanks to pioneering groundwork of Hayashi many years ago, Saudi-Japanese relations have evolved on many levels, stimulating profound, bilateral interest in each other’s culture, business, industry and technology. It is a natural evolution: Saudi Arabia provides for most of the oil Japan needs, through Saudi Aramco. The oil company embarked on multibillion-dollar projects and partnerships with Japanese corporations. Currently, hundreds of Saudi students are studying at Japanese universities and Arabic is being introduced as an elective foreign language in Japanese primary schooling. Hayashi was just a year-old toddler when World War I broke out. While the world clashed in a murderous and destructive war, the exotic tales of Arabia triggered an interest and a passion for the Arab world inside Hayashi. It led him later years to the Middle East on a journey that transformed his life and his outlook on the world. Taking advantage of a Japanese government scholarship in 1937, the then 21-year-old Hayashi traveled to Cairo to take the first step of his journey at the University of Cairo’s College of Arts and Literature. On his first visit to Cairo, he changed his first name to Omar and converted to Islam. Three years later, Hayashi had mastered Arabic and was on his way back home armed with a new language and full of ambition to introduce the Arab culture and ideas in his homeland. For the next five years, Hayashi lectured at Osaka University’s school of foreign languages and at Kyoto Imperial University. During that time, he also embarked on a project to produce an Arabic-Japanese dictionary. “I had accumulated around 50,000 words for the project and built the copper plates to print it,” Hayashi told a reporter in June. His Japanese-Arabic dictionary materials did not survive World War II. Allied bombing raids in Osaka made Hayashi’s four long years of labor literally go up in smoke. In Egypt, he wanted to help eradicate a disease that had haunted its people for ages: Bilharzia. This was contracted through bathing in water from the Nile Delta. Hayashi managed to convince the Egyptians that using cast iron pipes to hygienically transport water to from the Nile to homes across Egypt would reduce the risk. The pipes were imported from Japan. He also convinced a Japanese firm to invest 8.5 million dollars in building a sugar plant in the upper Nile, where huge amounts of surplus Egyptian sugarcane was being dumped. Hayashi managed to secure a 5 million dollars deal between a rubber manufacturer in Kyushu, and the Sudanese Ministry of Education to supply students with rubber footwear. He also landed in Saudi Arabia for the first time to help a Saudi businessman in Jeddah import Japanese textiles. In 1957, he helped host Sheikh Fahad Al-Salim Al-Sabah of Kuwait on his visit to Japan. “By the time his trip was over, the Sheikh had decided to use Japanese ship builders to build the very first mammoth Kuwaiti oil tanker, with a capacity of 46,000 tons,” Hayashi said proudly. “The deal cost 3.2 billion yen and was paid immediately in full,” he added. Japan in that period, said Hayashi, was in desperate need of financial capital to support its postwar economy and rebuilding efforts. The Middle East had that capital and was willing to spend it in return for technology, commerce and industry. Hayashi had the ability to communicate with both sides and bring them together. But others in Japan had their eyes on more that capital; they were looking for energy, and the Arabian Gulf region began to show strong potential to deliver that critical commodity. A few years after the foundation of the Arabian Oil Company (AOC), Hayashi became an adviser to the head of AOC until 1964, when he was appointed general manager of AOC, became a member of the board of directors and moved to Saudi Arabia — a move that lasted 17 years, until 1981. Because of his knowledge in both languages and cultures, Hayashi was frequently called upon to translate among the Saudi and Japanese officials. 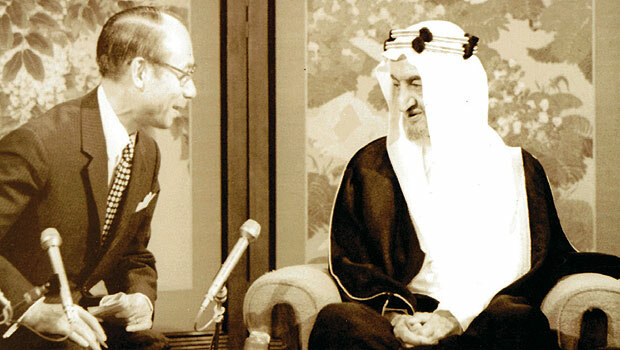 “I met King Saud around five times and King Faisal more than ten times.” Hayashi said. He remembers King Faisal’s visit to Japan in May 1971. He recalls a meeting with King Abdullah as crown prince and remembers that he donated generously to the Japanese Muslim Association. I also met him after he became the king. In two interviews with Hayashi in Tokyo, he wore a different golden watch each time; he said they were both royal presents. “The first watch was from King Faisal, and the second was from King Khaled, and both had the royal initials on them.” Now frail at 95 but still well-dressed, Hayashi remains mentally sharp and full of energy and determination to continue pursuing his goals of bringing the Arab world and Japan closer together. He dotes on his family, including son Tamotzo, who is now a surgeon working from a private clinic in Tokyo. His daughter Izomi is an engineering professor at the University of Shiga near Kyoto. Hayashi’s pride in his personal accomplishments sometimes seeps through his natural humility and gentle personality, but he immediately feels compelled to utter the words astaghferu Allah, begging God’s forgiveness for such a transgression of virtue. Relations between Saudi Arabia and Japan have been soaring beyond the commercial realm, and fundamental connections are often subtle. In the early 1980s, Saudi TV was one of many Arab TV stations to run a daily cartoon series about a young Sinbad and his amazing adventures around the world. The series was the first Arabic-language, Arab-themed animated production to ever appear on Saudi TV, and it got Saudi children glued to the screen, very few of who knew at the time that their favorite Arabic cartoon show was actually made in Japan. This all goes back to a young Japanese man who fell in love with the Middle East and Arab culture.